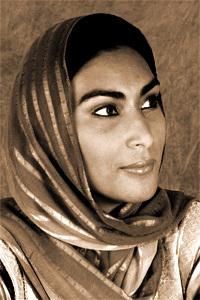 Nimah Ismail Nawwab is a writer, editor, poet, lecturer, and pioneering youth and women’s activist, as well as a photographer. Her first volume of poetry, The Unfurling , was published in 2004 by Selwa Press and her English essays and articles on Saudi society, customs, Islam, art, crafts, cuisine, and calligraphy have been published in Saudi Arabia and abroad. Her poetry has been translated into numerous languages and has been included in various international anthologies, including Side by Side: New Poems Inspired by Art from Around the World , Other Voices , The World Strand , and I Belong. Her work has also been featured in various print, radio, and television documentaries, including BBC World News , Newsweek International , and numerous others. She is currently working on two poetry manuscripts.